For that once in a lifetime experience, every time, Nautilus Aviation offers one of the best ways to see the world’s natural wonders just outside their doorsteps. With over 25 years of commitment to exceptional service, Nautilus Aviation have over 25 state-of-the-art helicopters across its bases in Queensland (Cairns, Townsville, and Horn Island), the Northern Territory and New South Wales. Now also proudly operating Sydney’s ‘Westpac Surf Life Saver Rescue Helicopters’, Nautilus Aviation is one of the largest General Aviation helicopter company in Australia. Departing daily, in Queensland guests can jump on board a scenic flight, enjoy a reef and rainforest day package, escape to a secluded sand cay, cast a line with HeliFish, design a tour of their own or, for the more adventurous, take the controls and fly themselves! The sky is no longer the limit, it’s your new playground! Fly with Nautilus Aviation and 'Experience the Difference'. With two world heritage listed areas on our doorstep, take in the awesome magnitude and grandeur of the Great Barrier Reef and the Wet Tropics Rainforest on this amazing flight. See famous sites such as Green Island, Arlington Reef and Vlasoff Cay before heading over the Northern Beaches, Double Island and Palm Cove. Glide high above the lush tropical canopy of pristine rainforest, Kuranda, the Barron Gorge, Stoney Creek Falls and Copperlode Dam before returning to Cairns. Tropical North Queensland is diverse in nature and offers attributes that can only be fully appreciated from the air! Cairns-based 'HeliFish' offers full-day fishing adventures flying over impressive landscapes to target anything from the mighty Barramundi, Mangrove Jack and Salmon to Gaint Trevally, Mackerel and Coral Trout! HeliFish is more than just fishing - it's a photographers dream! Expect to see sandy beaches, rainforests and the Great Barrier Reef. The flight home can even include a stop on a secluded sand cay to celebrate landing the big one, with a cold one! Specialising in helicopter fishing tours, the tours are flexible to suit personal requests, fishing skill and groups of all sizes! Take off from the lush city of Cairns, over the mountain clad ranges and head out to the Coral Sea, where the size and majesty of the breathtaking Great Barrier Reef can only be truly appreciated from the air. Take in its splendour as you fly over the famous sights such as enormous Arlington Reef, the Jewel of the Sea, Green Island and isolated Upolu Sand Cay. Bring your camera for this wonderful experience that will stay with you for a lifetime! Explore ancient rainforest covered mountain ranges and valleys only minutes from the centre of Cairns. Soar over the majestic Lake Morris, up through the Barron Gorge and Falls to Kuranda, view world heritage listed rainforest then drop down to sweep along the tropical coastline and northern beaches to Cairns City. Only by helicopter can the scale of these ancient rainforests, waterfalls and their pristine beauty be truly understood. The memory of this flight will stay with you forever. Ideal for visitors, who love the great outdoors! Spend the morning taking a horseback ride through the tropical landscapes of Kuranda, over rainforest mountains and bubbling creeks. Transfer to the Heliport for an awesome flight over the Great Barrier Reef to the exclusive pontoon at North Hastings Reef. Enjoy a barbecue lunch and before you enjoy an afternoon of snorkelling. Scuba diving, either for the beginner or experience diver, is also available at an additional cost. Cruise back to Cairns with live music, cheese platter and a complimentary glass of wine. An exclusive experience, on your own piece of paradise. Feel the thrill of flying over the picturesque coral-studded sea before landing on Vlasoff Cay, a pristine sand cay in the heart of the Great Barrier Reef. Relax on the pure white sand, beach comb for treasures, lay in the shallow crystal waters or snorkel straight off the cay and discover the magic of the underwater world. The experience is complete with a gourmet picnic hamper and sparkling wine and helicopter return to Cairns. Ideal for visitors, who love some adventure! Spend the morning taking a quad bike ride through the tropical rainforest, over creeks and mountain ranges. 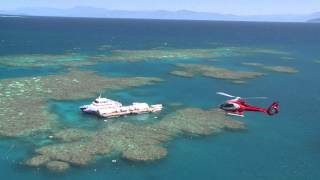 Transfer to the heliport for an awesome flight over the Great Barrier Reef to the heli pontoon at North Hastings Reef. Enjoy an afternoon of snorkelling, followed by a barbecue lunch all included in the package. Scuba diving, either for the beginner or experience diver, is also available. Cruise back to Cairns with live entertainment, cheese platter and a complimentary glass of wine. Begin your journey on board the Kuranda Scenic Railway, discovering the living colour and natural beauty of rainforest millions of years old. From the picturesque destination of Kuranda Village, glide just metres above the rainforest canopy with Skyrail, before descending through the canopy layers and transferring to Cairns for a spectacular helicopter flight over the coral-studded sea to Hastings Reef. With over two hours on board the Down Under Dive and Cruise luxury vessel, Evolution, complete your day with an Aussie barbecue lunch and snorkel (introduction/certified dive additional) and return cruise with complimentary glass of wine, cheese and live entertainment! An inspiring tour combining spectacular views of North Queensland’s coastline and a cultural experience with a local Kuku Yalanji Aboriginal tour guide in the Daintree. The only place on earth where two World Heritage-listed sites are side by side – where the rainforest meets the reef! Learn about the unique environment and the different foods and medicines utilised from nature – even sample some bush tucker and try traditional hunting practices. Beyond the Tablelands and over outback terrain, be transported to one of the most fascinating periods of Australian History. 160 kilometres west of Cairns, arrive at Mount Mulligan Station – a working cattle station rich in Australian and Dreamtime history. Be welcomed by the 18 kilometre sandstone ridge that is Mount Mulligan. Larger than Uluru, its majestic beauty is mother nature at her best. Mined for coal, rushed for gold and farmed for cattle, guest experiences include tours of the old township, historic cemetery and mine ruins, plus a stop at the historical Tyrconnell mine. Built in 1876, Tyrconnell was the most famous mine at the centre of the Hodgkinson goldfield. Experience the magic of the Great Barrier Reef from above, with an exhilarating helicopter flight over picturesque reef systems and up close on board luxury vessel, Evolution. Be treated to an Aussie barbecue lunch and snorkelling to discover the mysteries of the underwater world. Scuba diving for beginners and experienced divers, along with a coral viewing from the semi-submersible are available on board at an extra cost. Pilot your own scenic flight over the Great Barrier Reef! With a pre-flight briefing and one of their highly experienced instructors by your side, the sky really is 'your' playground! A once in a lifetime opportunity or the start of a career as a helicopter pilot, the total amount of flight time experience within this product can be counted as part of your qualification - a qualification you can pursue with Nautilus Aviation! Discover one of the great natural wonders of the world with a helicopter scenic flight and Sunlover Reef Cruises! Sunlover Reef Cruises operates a fast, air-conditioned catamaran to a large pontoon (floating platform) located at pristine Moore Reef, approximately 40 kilometres from Cairns. On board, enjoy complimentary snorkelling equipment, glass bottom boat, semi-submersible, underwater observatory, touch tank and optional extras including scuba diving, guided snorkelling safari and sea walker helmet diving. For visitors that aren't pressed for time and want to experience as much as possible while in Cairns. On your first day journey through world heritage listed rain-forest aboard the historical Kuranda Scenic Rail. Spend the day exploring Kuranda before making the Skyrail journey of gliding over the rainforest. Kuranda upgrade option: enhance your experience with an additional trip to RainForestation. Experience a 45 minute rainforest tour. Followed by a buffet lunch and a Dreamtime walk where you will learn about indigenous culture. Day two prepare yourself for an extraordinary day out on the Great Barrier Reef. Cruise to two stunning outer reef destinations aboard Evolution and enjoy a barbecue lunch and snorkelling. 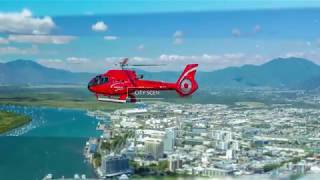 On your return to Cairns experience a spectacular helicopter flight over the Reef.